October is National Chiropractic Care and Physical Therapy Month! At Massapequa Pain Management and Rehabilitation, we felt that it was especially important to discuss the role of physical therapy for hip and knee pain and chiropractic care for lower back pain. There are many advantages to incorporating these services for proper physical rehabilitation. Working with a trained physical therapist, for example, can help you achieve your short-term and long-term wellness goals. They offer a “hands-on” approach to give attention to parts of your body that may need extra care. If you have hip pain, a physical therapist will work with you to increase your range of motion and enhance your mobility. This will help keep you from developing severe comorbidities due to immobility such as blood clots, skin infection, and venous stasis ulcers. Hip pain may be due to infection, bursitis, osteoarthritis, or nerve impingement. A physical therapist can help you feel better by offering rehabilitation techniques such as functional mobility tests, gait evaluation, palpation, a range of motion exercises and strength measurements. Over time, with the help of your physical therapist, these techniques will have you feel better and reduce the pain associated with your hip. A trained chiropractor will work with you by initially asking questions about your lifestyle, including diet, exercise, sleep habits, medications, past injuries, use of drugs or alcohol, and medical history. The chiropractor will then complete a full physical examination, including tests that will measure your spinal mobility. While there are many causes of lower back pain such as arthritis, spinal stenosis, disc herniation, and muscle sprain, a chiropractor can perform spinal manipulation which involves moving a joint of your spine and adjusting it in place. The chiropractor may also do other treatments such as soft tissue and muscle massage and spinal alignment to ensure proper recovery. Working with your chiropractor through several sessions can help control and improve your back pain. We hope this information was useful for you during National Chiropractic and Physical Therapy Month! 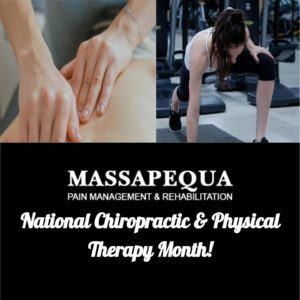 Note that Massapequa Pain Management and Rehabilitation is here to offer chiropractic, physical therapy, and many other services to help treat your pain. Contact us today to make your appointment and take the first step to a better you!